WE said it was coming. And it could not have been any more emphatic. 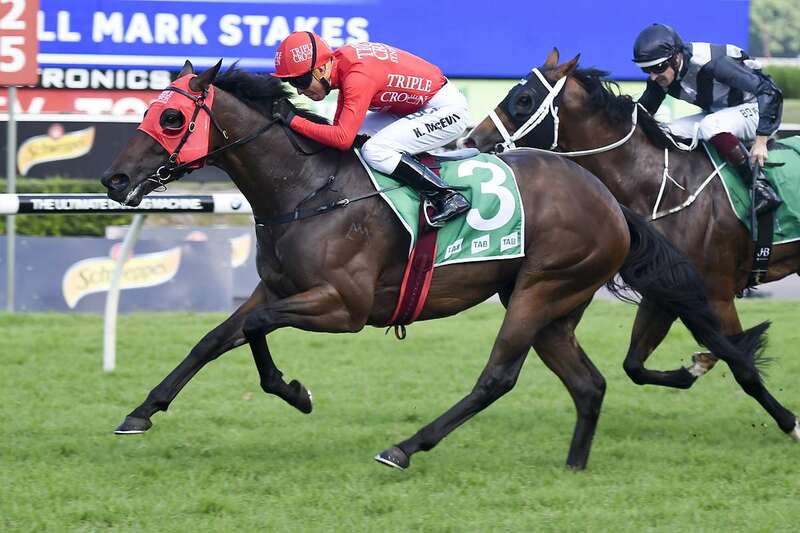 Stepping up to 1200m for just the second time in his career for the Group 3 Hall Mark Stakes at Randwick on Saturday, Redzel proved a class above his trailing rivals, drawing clear to claim a deserved success and leave his owners in raptures. The wins continue to fly in for Triple Crown Syndications, with four winners from our last seven runners and, after going down a nose in the Group 2 Challenge Stakes and a short head at Group 1 level a month prior, this triumph was as sweet as they come. It was no certainty that Redzel would stay the extended distance. After being agonizingly caught on the line in the closing stages of the Group 1 Galaxy Handicap by stablemate Russian Revolution over 1100m, the questions were there to be answered; and answer them he most certainly did. Flying out of the gates like a coiled spring Redzel took the race to his rivals and, as he entered unknown territory down the home straight, the son of Snitzel kicked again under Kerrin McEvoy, drawing away from the well-fancied Counterattack and Hellbent. Scenes of euphoria greeted the four-year-old in the winners’ enclosure, as his large band of supporters celebrated their duly earned success. With the win, Redzel has taken his earnings from his three starts this preparation to beyond $300,00 and total career earnings to almost $750,000, a superb return for what was a $120,000 purchase from the Magic Millions Gold Coast Yearling Sale in 2014. On future targets Snowden outlined his plans to take the sprinter back to Group 1 level, in a bid to strike at the highest level. “He almost won a Group 1, got beaten a half head a month agom so I don’t see a Group 1 being out of reach,” he added. The red silks of Triple Crown had already been carried to success in the very first race at Kembla Grange on Saturday, as two-year-old filly Moss Trip, beginning her racing journey at the track, showed resolute desire after being knocked around in the straight to surge to the front on the line, and make it a perfect start with Courtney Van Der Werf in the saddle. In an exciting moment for her owners, the filly demonstrated good speed and sparkle that could see a bright future ahead of her. Congratulations to both sets of owners! Get your winning photos here from Bradley Photographers!